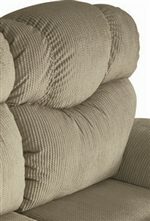 This Power La-Z-Time® mid-size reclining loveseat features a casual and comforting design with thick padded arms and clean lines. With the dual power recliners, polyurethane foam, as well as the chaise seat and footrest you will achieve added comfort, allowing you to recline back and relax. Enjoy the custom order fabric or leather of your choice and make your home as personalized as you. The Lancer Power La-Z-Time® Full Reclining Loveseat by La-Z-Boy at Jordan's Home Furnishings in the New Minas, Halifax, and Canning, Nova Scotia area. Product availability may vary. Contact us for the most current availability on this product. Tailoring Finely tailored in beautiful fabrics or luxurious leather. 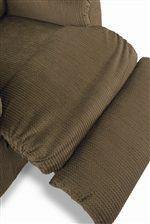 Arm Plush, pillow style arms. The Lancer collection brings you the best reclining pieces of their kind. With a comfortable and casual style, each piece from this collection will blend in with any decor of your home. Including sofas, loveseats, recliners, and much more, the Lancer collection is sure to fit your every need. Made in the USA, this collection provides you with exceptional quality and the latest features. 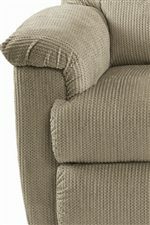 Each recliner is provided with a lifetime warranty to provide you with a lifetime of happiness with your furniture. A lot of the pieces are also available in power option, making your life easier. Indulge your home with the comfort you deserve. The Lancer collection is a great option if you are looking for Casual furniture in the New Minas, Halifax, and Canning, Nova Scotia area. Browse other items in the Lancer collection from Jordan's Home Furnishings in the New Minas, Halifax, and Canning, Nova Scotia area.